Rabbi Nickerson - Friday Night Sermon 5779 - With the current government shutdown, the Los Angeles Teacher’s strike, and so much happening around the country and world, what can we learn from the 9th plague brought down upon the Egyptians? How can we combat the looming darkness that seems to be overwhelming us everywhere we turn? Rabbi Joel discusses the lessons learned from the plague of darkness and why it may serve as the precursor to the final plague, death of the firstborn. On January 4, 2019, Jonathan Weisman wrote an op-ed for the New York Times titled, "American Jews and Israeli Jews Are Headed for a Messy Breakup: Is the world ready for another Great Schism?" 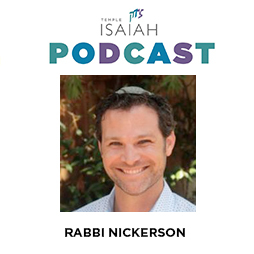 In their first Clergy Suite Conversation of the New Year, Rabbis Nickerson and Frimmer take a closer look at the article and explore the "schism", as well as the challenges and opportunities that present themselves for Diaspora Jews in the 21st century looking to make a meaningful connection with their homeland. Friday Night Shabbat Sermon 5779 - On Shabbat Va'era, Rabbi Frimmer examines Moses' struggle to lead the Israelites out of slavery, noting his early setbacks and deep disappointment. 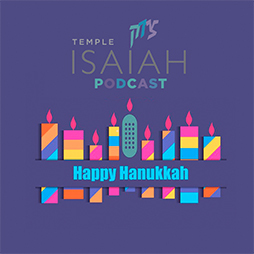 Drawing on the wisdom of Torah, Parker Palmer, Brene Brown, and popular advice for holding onto New Year's resolutions, this sermon connects the effort we all face to change and persevere, and offers the possibility that God and community may help us achieve all our goals, if only we would welcome them in. 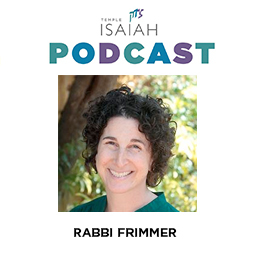 Rabbi Frimmer - Friday Night Shabbat Sermon 5779 - The death of a loved one gives us a unique opportunity to do teshuvah -- a change in direction, a new behavior – an experience of forgiveness that was previously thought to be prohibited, unheard of, or unimaginable. But, death changes the rules. Emiliana Guereca Zeidenfeld, also known as Emi, is not only a member of Isaiah, she's also the founder of the Women's March LA Foundation, a non-profit organization, and the driving force behind the official Women’s March in Los Angeles. As headlines surfaced (again) citing anti-Semitic language and affinity from the top leadership of the Women's March, Emi took time to address questions and concerns, while keeping us focused on the work of fighting for Human Rights. 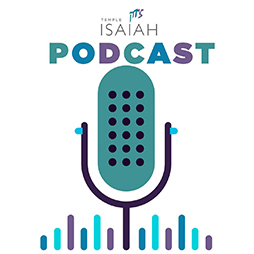 Friday Night Shabbat Sermon 5779 - Rabbi Nickerson shares reflections during Isaiah's Friday night service, offering insight into our tradition and ways to make Judaism resonant and relevant in our lives.